Hawaii would have been the first to impose the prohibitions at a statewide level. (AP) — Two Hawaii legislative committees have rejected proposals that would have banned a variety of plastics used by the food service industry. The committees on Wednesday amended an anti-plastics bill to delete a section that would have prohibited the sale and use of plastic drink bottles, utensils, stirring sticks, bags and straws. But the House Consumer Protection and Commerce Committee and the House Judiciary Committee both voted to keep a section of the bill establishing a working group to develop a plan to eliminate single-use plastic packaging. 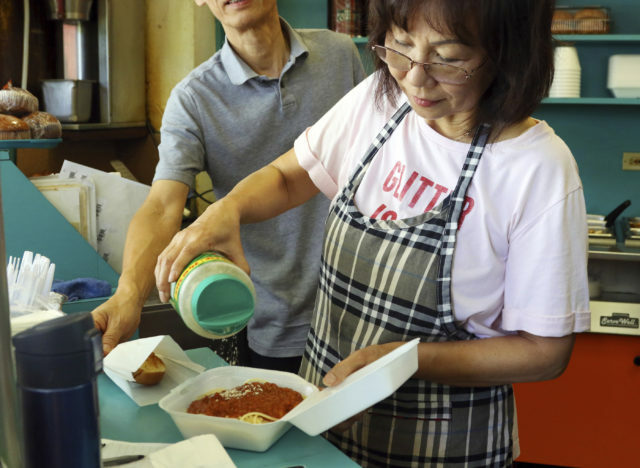 Belinda Lau, manager of the Wiki Wiki Drive Inn takeout restaurant in Honolulu, sprinkles cheese on an order of spaghetti in a styrofoam container. They are sending the amended bill to the House Finance Committee for further consideration. The committees deferred another bill that would have banned polystyrene foam containers at restaurants and other businesses. The proposed plastic bans aimed to reduce ocean pollution and climate change.